Onstate Technologies designs, manufactures and markets innovative, energy-efficient solid-state lighting (SSL) products incorporating light emitting diodes (LED) and electronics. Onstate is committed to providing world-class, innovative, professional LED lighting products for residential and commercial lighting. Onstate's LED lighting solutions feature Onstate's proprietary Inverse LightTM optical system, thermal management, advanced opto-electronics and high-power LED technology in an all-weather, integrated unit. The result is higher systems efficiency and lower maintenance and operating costs. Onstate offers full technical support on its products. 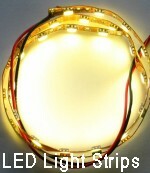 Save up to 80% on lighting costs. 1. Long life, low maintenance. 6. Cool, quiet, safe operation. 7. Instant light. No warm-up. 8. High quality white light. LED lighting, LED lights, LED light bars, strips, LED bulbs, LED lamps, LED dimmer, CCTV LED illuminators, 1-100W LED lights, occupancy PIR motion sensor, video light, flood, area, street, cove, shelf, cabinet, counter, accent, display, white, colour, infrared light, Landscape, track, professional, residential, commercial, custom manufacturing, manufacture, wholesale, retail, LED parts and electronics.